Maine Coast Sea Vegetables Dulse Whole Leaf 2 oz. 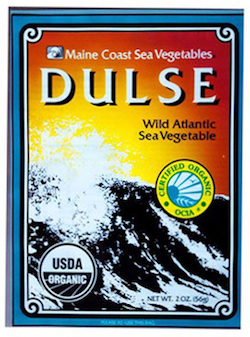 Dulse is a colorful salad ingredient, is tasty in soups and is zesty when fried and boosts the flavor of any sandwich creation. Dulse doesn't require any soaking or cooking, which makes it a great snack to be enjoyed right out of the bag. Maine Coast Sea Vegetables is committed to the rediscovery of this ancient food source from the sea. Their mission is twofold: to provide high-quality North Atlantic sea vegetables as user-friendly foods and to build long-term relationships with their suppliers and the environment.